Further to my letter published in the Observer on February 14 regarding the ripping out of all the hedging, trees and vegetation around the pond in Farm Road, I was again horrified to see all the mature, possibly ancient, trees and hedging being cut down on the old Post Office site, known as The Elms, at the beginning of Farm Road on March 4. I just couldn’t believe that this wanton destruction of wildlife habitat was happening again. I believe it is illegal to cut down hedges etc during the nesting period (March to August) if it is known there are nests present. This hedging was full of sparrows and I have seen them taking nesting materials into the hedge so am pretty sure nests have been destroyed as a result of this work. This site is subject to a planning application ‘18/03146/FUL’ and there is a report from the environment officer that states ‘Nesting Birds: Any works to the trees or vegetation clearance on the site should only be undertaken outside of the bird breeding season which takes place between 1st March and 1st October. Why is this council allowing this destruction of habitat to take place at a time when our wildlife is in crisis and we are all meant to be ‘doing our bit’ to help nature? 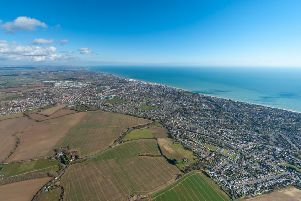 I despair that Bracklesham Bay, which was once a pretty little village with lots of greenery and abundant with wildlife, is fast becoming a concrete jungle.